Phnom Penh (VNA) – The Vietnamese nationals in Cambodia and the Republic of Korea (RoK) have embraced the spirit of Tet as the Lunar New Year draws near with various activities. A cultural event was held in Phnom Penh by the Vietnamese students in Cambodia on January 13, during which Charge d’ Affaires of the Vietnamese Embassy in Cambodia Nguyen Trac Toan spoke highly of the celebration, and congratulated the Vietnamese students for their robust achievements in 2018. He took the occasion to thank the Cambodian Ministry of Education, Youth and Sport for their support for the Vietnamese students. Also, Toan asked the students to use their studying time in Cambodia to make contributions to the traditional friendship between the two countries. Mom Sochanna, an official from the Cambodian ministry, for her part, hailed the efforts made by the Vietnamese students in the country. She wished them a happy new year, and hoped that they will excellently complete their study, helping consolidate the bilateral relations. Currently, there are more than 100 Vietnamese students in Cambodia. Over the past years, generations of Vietnamese students have become important human resources for agencies and areas related to Cambodia, and served as a bridge to further the flourishing the two countries’ ties. 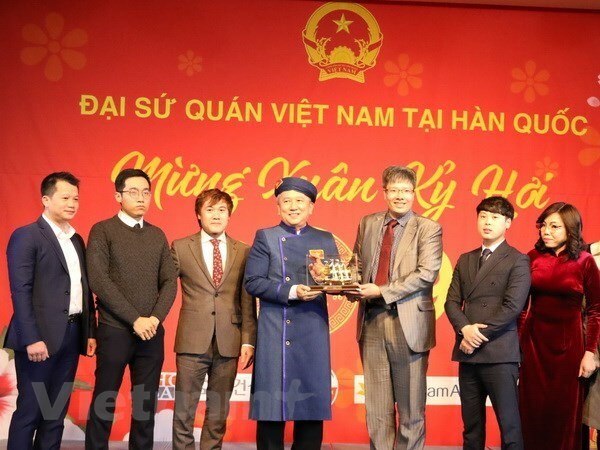 The same day, the Vietnamese Embassy in the RoK organised a grand celebration to welcome the New Year, drawing the participation of several Vietnamese and RoK businesses, and some 200 Vietnamese expatriates. Briefing the thriving Vietnamese economy in 2018, with significant contributions made by RoK enterprises, Vietnamese Ambassador Nguyen Vu Tu underlined that Vietnam and the RoK are enjoying robust cooperation in various sectors in the past years. As the Vietnamese community in the East Asian nation has developed unceasingly, they should join hands with the embassy to elevate the Vietnam-RoK relations to a new high, especially when both sides are celebrating the 10th anniversary of the strategic cooperative partnership in 2019.